The Netherlands is bordered in the north and west by the North Sea. Twenty-six percent of the country’s landmass lies below sea level. Global warming will bring slow rises in sea level, whilst extensive draining off in the west of The Netherlands is resulting in a fall in ground level. Given this background it is easy to understand why one of the main goals of the Dutch government is to protect the country against floods. Here knowledge and insight is required regarding several morphological processes pertaining to the Dutch coast. Such knowledge is acquired by means of coastal studies; quantitative data such as wave height and length, current speed and direction, water level, sediment transport and changes in the seabed are collected. However, in practice the collection of reliable data in or just behind the surfing zone is often extremely difficult or even impossible using conventional sampling methods. The Water and Strand Profiler, or WESP was built for this purpose. the WESP are filled with flexible polyurethane to prevent floating and top-heaviness. As the Dutch coast is systematically subject to erosion, monitoring the morphological state is essential to guarantee safe coastal defences. When monitoring data reveal a severe decline in the coastline, sand replenishment must be considered. Nowadays, this often entails ‘underwater replenishment’ or ‘wave screen replenishment’, where sand is deposited off the beach, beneath the surface, just behind a second sandbank. In fact, this is quite a new technique and as scientific views regarding it are not entirely unambiguous, morphological monitoring of the depleted area over a period of at least five years remains necessary. As the WESP is used for hydrographic activities in the zone between +3 and –5 metres MSL, it is the ideal vehicle for this job. In deeper regions complementary measurements can be done using a shallow-draught vessel equipped with a single- or multi-beam echo sounder and DGPS-LRK positioning system. To ensure the absence of gaps in the data, both WESP and vessel measurements are performed simultaneously and DTMs exchanged. The WESP is equipped with DGPS-LRK and an IXSea Octans. The accurate geometric measurements of the WESP allow accurate positioning of all three wheels to be logged whilst underway. The broadness of the wheels means a minimum of sand displacement beneath the moving WESP; placing a wheel on several confessed points along the coast allows the position of each wheel to be easily checked. The altitude of all three wheels can be watched on the survey screen belonging to the data collection software. 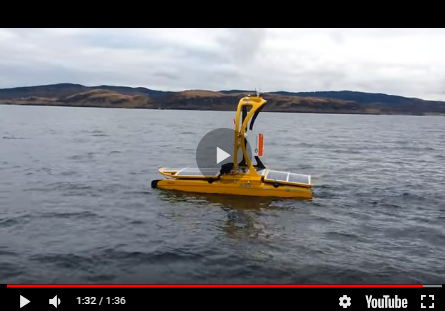 Not only has the WESP clearly shown its use in hydrographic activities, it has recently proven to be a very successful instrument in the assessment of ecological data. In one study a Van Veengrab was used to sample benthos along several transect lines and a small trawl was used to do a pilot fish survey. From an ecological point of view, the subtidal zone (just beyond the most seaward recessions of low tides) has been studied relatively poorly, whilst it in fact hosts a major number of specific habitats and biological communities. Many marine organisms such as fish and macrofauna spend an important part of their lifecycle in these zones. To understand and describe these communities more comprehensive chemical, physical and biological assessment should be conducted in this field. The main reasons for this omission are the hazardous situations that may occur when taking samples from an unstable floor whilst boating or using waders. The use of divers is, on the other hand, expensive and time consuming. As the WESP is designed and built especially for profiling this region, it provides a great and stable platform from which ecological samples can be taken in an easy and safe way. The onboard GPS system may be used to combine geographical information with field samples, and complementary pertinent physical data (temperature/salinity/oxygen) can be collected simultaneously. Since 1994 the Water Information Service has performed wave and wave run-up measurements. In the near future, wave-overtopping measurements will also be conducted. For these purposes a field-site was built near the village of Petten, on the Dutch coast. The site consists of several poles placed in the surf zone, to which sensing instruments have been attached. On top of the poles at a height of approximately 8 metres above sea level there is a platform containing the data collecting hardware. The maximum water depth around the poles is 4 metres. At a greater distance from the land, two wave buoys are deployed. During the storm season (15th September to 15th May) the site is operational 24 hours a day and a great deal of very important data is collected. However, equipment can get damaged and as a result data collection may fail. In these circumstances conditions often preclude the use of a boat for measurements or maintenance. Here the WESP can offer a helping hand no matter how bad the weather. Although it happens infrequently, the WESP can get stuck. Some areas along the Dutch coast consist of layers of clay or peat covered with only a thin layer of sand. When, due to corrosion, holes arise in these layers the WESP may get stuck with one wheel in such a soft spot and when this happens it has proved to be quite a job to release it again. On one occasion, the assistance was required of a special vessel equipped with crane to lift the wheel, in combination with two bulldozers on the beach. The WESP itself suffered hardly any damage, due to its special ‘pull’ locations on the frame. Fortunately, the sand layer along the Dutch coast is generally thick enough and such problems are rare. But in 2004 another difficulty was experienced. A sandbank near the shore turned out to be too steep for the WESP and as a result the front wheel showed itself to be capable of digging itself into the bank instead of rolling over it. The ANI has been able to use the WESP only in a relatively small area along the Dutch coast because the vehicle cannot be transported easily. In 2003 several companies were contacted and invited to invent a way of transporting the WESP over water. As a result, one Dutch company has come up with a design to make the WESP floatable and therefore able to be towed. But up until now the design has not been built due to lack of finances. WESP as much as possible. Nevertheless, the operating costs of WESP make it a second choice in cases where land surveyors can do the job. On the other hand, the WESP has proven to be reliable and extremely suited for surveying in bad weather, westerly winds and high tides. Moreover, for surveys within the wave-zone land surveyors or vessels cannot provide a viable alternative to the WESP.